Snorkeling along the Alabama Gulf Coast offers an exciting perspective of underwater habitats . 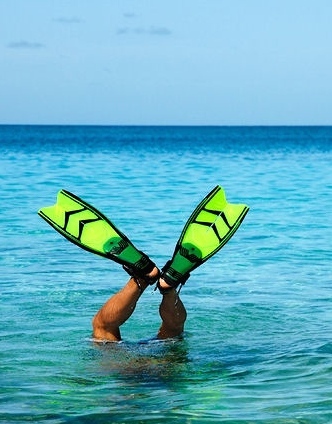 We offer guided snorkeling trips aboard our Glass Bottom Catamaran staffed with crew of professional Dive Masters. These vessels feature 4 door size glass panels for underwater viewing while on the boat. These two hour guided snorkeling trips will take you and your family to a marine oasis at one of our best, sand-bottom snorkeling sites. Tropical’s, Octopi, Spade Fish, Sea Turtles, Game Fish and Rays are among the many amazing creatures we may get the chance to see. Our helpful guides offer local marine knowledge and the latest in proper techniques in snorkeling and free diving. Available spots are filling quickly, so call today to reserve your spot aboard one of our guided snorkeling tours. Call AAA Charters at 251-609-2525 to set up your underwater adventure. Departing from Orange Beach AL, just minutes away from the beaches of Gulf Shores, AL. This entry was posted in Coastal AL Adventures, News and tagged alabama snorkeling, coastal alabama adventures, guided snorkeling tours, gulf of mexico snorkeling, gulf shores snorkeling trips, gulf shores things to do, orange beach snorkeling guides, snorkeling alabma gulf coast, things to do orange beach al on May 31, 2014 by AAACharters Team.